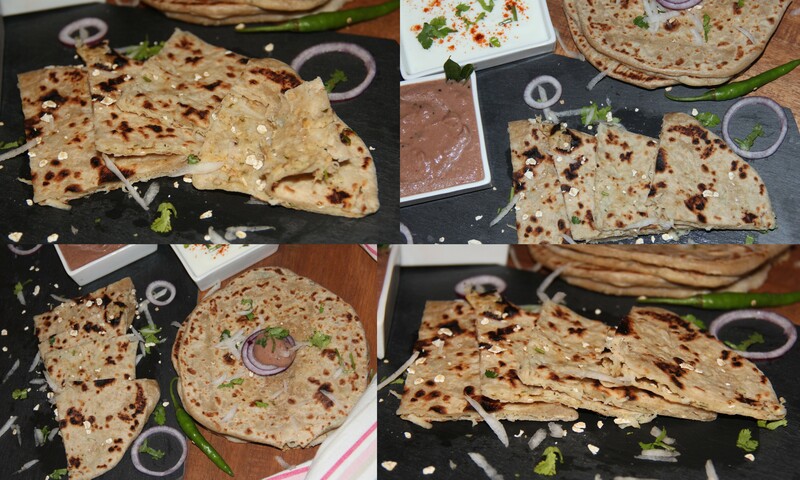 This is Indian flat bread stuffed with Mooli (Radish) and Oats. It can be served for breakfast/lunch with any yogurt or curry of choice. This stuffed breads needs a good sturdy dough as the radish oozes out water even after squeezing it so the oats helps to imbibe the water and makes a stiff stuffing. The spicy and flavourful stuffing makes it tasty and can be relished on its own. It is a perfect, easy to carry dish for long journeys and picnic and brings a welcome break from routine stuffed Aloo (Potato) Paratha as it has little spicy touch. Prepare the dough and keep it aside. Grate the mooli/radish and keep aside for 15-20 minutes and later squeeze the water from it. In a mixer jar add blend coriander, mint, green chilli and peanuts to paste without adding any water. Add ground mixture, Cumin, Fennel Seeds and dried mango powder to the squeezed mooli and mix well (Adding Oats helps to remove excess water in Mooli) and divide the stuffing into 7-8 equal portions. Slightly dust the dry flour and roll to 5 -6 inch diameter. Place it on the heated tawa and cook on the medium flame. When you see bubbles rising on the surface, flip it over and cook on the other side until golden brown. 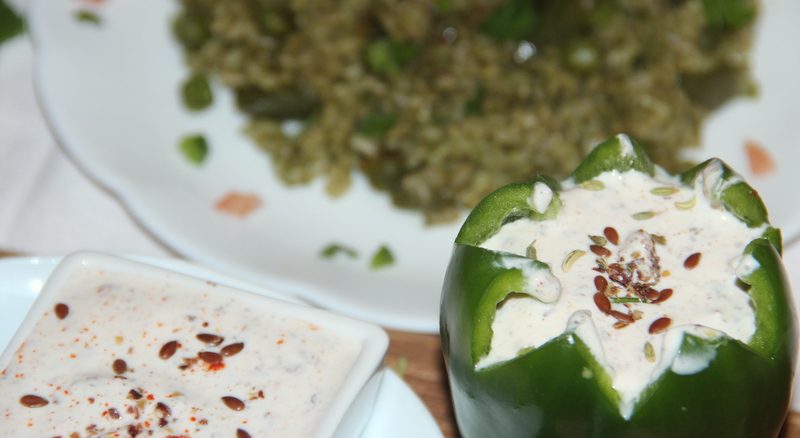 Serve with any Raita/Yogurt dip. Squeezing water from mooli help the parathas from breaking while rolling the dough. Add 1-2tbsp of oats to the stuffing if you feel the stuffing is still wet before stuffing. Posted on February 8, 2015, in Indian, Main dish and tagged Stuffed Indian bread. Bookmark the permalink. 20 Comments. Mmm – I’ll have mine with yogurt please, Chitra! What a unique recipe Chitra! I can see the paratha served with a dip as a side with soups or salad. Delicious! Wow! I never thought of adding oats, seems like now it won’t be a pain to make mooli parathas. I shall try this over the weekend only! 🙂 Thanks for this recipe!